Office 365 Cloud App Security helps global administrators, security administrators, and security readers gain insight into the cloud services people in an organization are using. For example, you can see where users are storing and collaborating on documents and how much data is being uploaded to apps or services that are outside of Office 365. 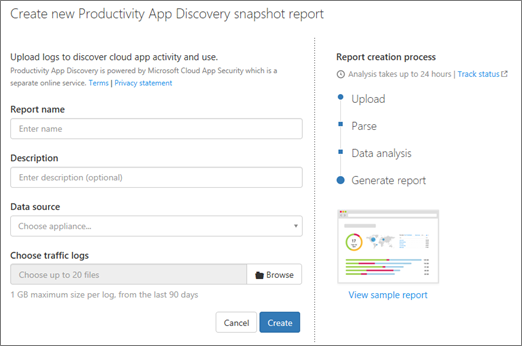 To generate an app discovery report, you manually upload your web traffic log files from your firewalls and proxies, and then Office 365 Cloud App Security parses and analyzes those files for your report. You must be a global administrator, security administrator, or security reader to perform the tasks described in this article. To learn more, see Permissions in the Office 365 Security & Compliance Center. To create an app discovery report, you identify the vendor data source for the log files that you want to have analyzed, select the log files, and then request the report. Use web traffic log files that include peak traffic periods to get the best representation of usage in your organization. Collect your web traffic logs and data sources for Office 365 Cloud App Security. Choose Discover > Create new report. Specify a name and description for your report, and then select the data source for your web traffic logs in the Data source list. If a data source that you'd like to use is not listed, you can request that it be added. Select Other for Data source, and then type the name of the data source that you're trying to upload. We'll review the log, and let you know if we add support for the data source that generated it. Browse to the location of the log files you collected and select the files. The log files must have been generated by the data source that you chose for the report. Click Create to start the report creation process. To see the status of the report, click Manage snapshot reports. When a report is ready, you'll see the View report option.